Norway's first capital city, founded more than 1,000 years ago, is an university city with a lively nightlife scene. Fires have ravaged the city regularly over the years, and today, many of the buildings are modern, though the Old Town Bridge and the iconic Nidaros Cathedral give some sense of its true age. 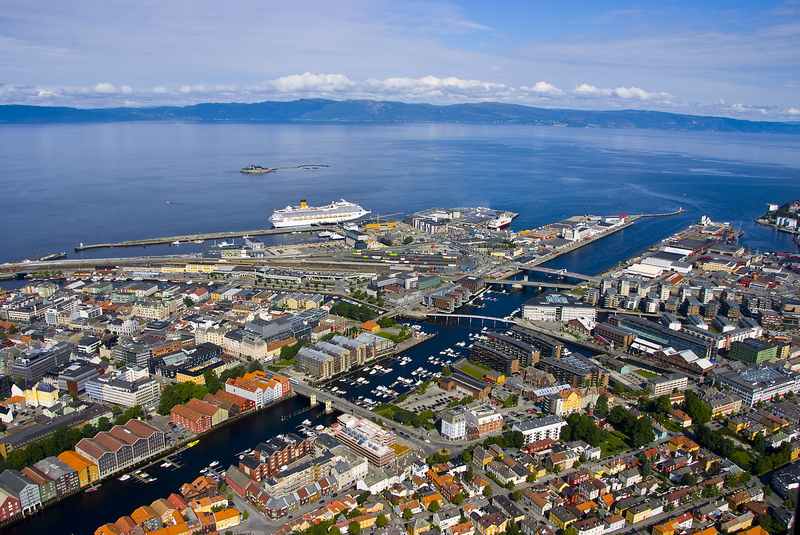 The third largest city in Norway, with 181,000 inhabitants is often referred to as Norway's capital of technology. This is largely due to the Norwegian University of Science and Technology and the research foundation, SINTEF, being located here. The students adds a youthful exuberance to this thousand-year old city. The city has a rich cultural scene and hosts a number of festivals and events throughout the year. Although the summer weather in Trondheim is rarely scorching, there are many sandy beaches close by which soon fill up on the sunniest of days, particularly around the Lade area and the Sjobadet . Don't forget to visit Stiftsgarden, the King of Norway's official residence, which also happens to be the oldest wooden building in northern Europe, while the Archbishops Palace is the oldest secular building in Scandinavia. With its colorful riverfront warehouses, wide streets and partly pedestrianized heart, it's a simply lovely city with a long history. You can see it all in one busy day, but it takes more time if you're to slip into its lifestyle. 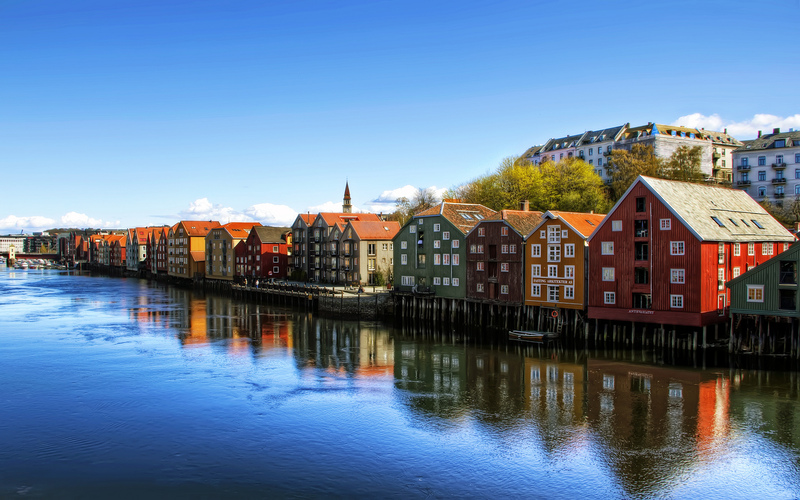 Trondheim was founded by the Viking King, Olav Tryggvason in 997 and was the capital of Norway for 200 years. The city became an archbishop's site in 1152, and in the same year, the country's first school, the Cathedral School, was founded. By the Middle Ages, this central Norwegian city had become an important religious pilgrimage center and trading hub. After a devastating fire which destroyed much of Trondheim in 1681, the city was rebuilt using a gridiron plan with broad avenues intended as firebreaks. 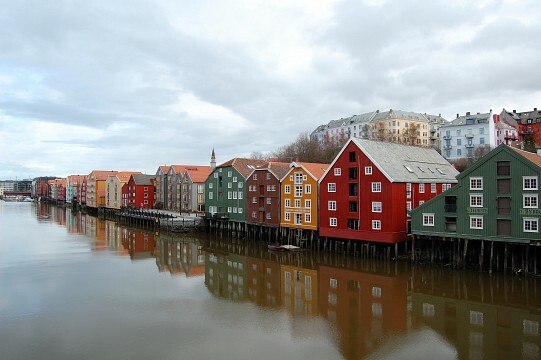 Even today, Trondheim is referred to as one of the typical wooden cities of Europe, and the city center has many special wooden buildings, some built as far back as the 1700s. A must-do in Trondheim is a visit to the city's old port area at the mouth of the River Nidelv. This idyllic neighborhood on the east side of the river features old timber buildings, originally the homes of the working class. The houses have been restored and the neighborhood is bubbling with life. With its charming and colorful wooden houses along the river, it is the ideal place to go for a stroll. Here you can browse for local handcrafted goods in the small boutiques or go for a coffee at one of its inviting cafés. Dating back to the late 12th Century, the palace's west wing now houses a number of historic displays, including the Norwegian Crown Regalia exhibit - a spectacular collection of Norway's crown jewels - as well as the army and resistance. Over in the south wing, the Archbishop's Palace Museum includes original sculptures and archaeological finds from the nearby Nidaros Cathedral. 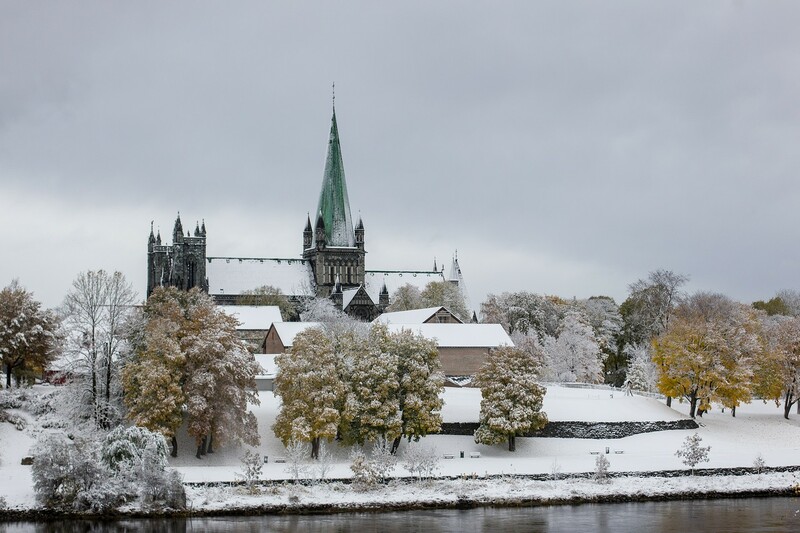 Nidaros Cathedral is Scandinavia's largest medieval building and was built over the grave of St. Olav. Construction started in 1070, but the oldest parts are from the middle of the 12th century. In the Middle Ages, and from 1818 to 1906, the kings of Norway were crowned in Nidaros Cathedral. From early June to early August, you can climb the cathedral's tower for a great view over the city. The Old Town Bridge connects the two banks of the river Nidelven – the city center and Bakklandet. The bridge is 269 feet long. Its nickname as the ‘The Portal of Happiness’ is taken from the lyrics of Oskar Hoddø’s waltz. 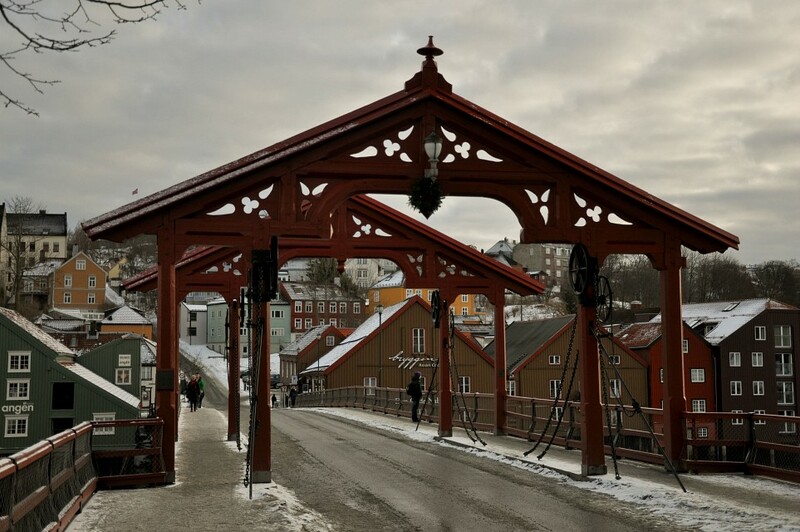 The Gamle Bybro is one of the most photographed attractions in Trondheim. 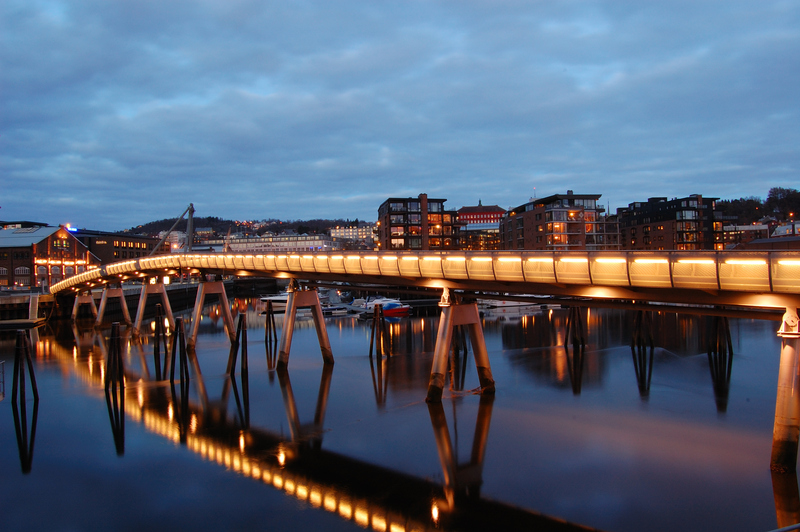 It also gives you a spectacular view of the NTNU university buildings, the Wharf, Bakke Bridge and the Trondheim fjord. ‘The Monks Island’ is located just outside the city. This little island with a fort is situated in Trondheim harbor and served as Trondheim's execution ground and special prison in ancient times. During the summer season, you can enjoy lazy days at the beach and relax, visit the café, swim or learn about the exciting history. Most restaurants, pubs, and bars are located in the city center, at Bakklandet or at Solsiden. You can find everything from exclusive restaurants to budget alternatives, and fast food restaurants. Don't forget to to try the local specialty, vafler medøst (waffle and cheese). The Nordre Gate makes up the city's main shopping district, being completely pedestrianized. In addition to the small, more unique shops, the city center also has shopping centers. In the city center, you can choose from Trondheim Torg, Mercursenteret, and Byhaven. Trondheim is a compact city with everything within walking distance of the city center. If the weather is nice, it is perfect to explore on foot. The local bus service is run by Team Trafikk and they provide a comprehensive service throughout the city. It has its central transit point, where all lines stop, on the corner of Munkegata and Dronningen's gate. Trondheim’s tram-line, the Gråkalbanen, runs west from St. Olavsgata to Lian, in the heart of the Bymarka. During the 20 minute trip, you can take in the sights of the old town before seeing the splendid view of the city. Antique trolleys trundle along this route on Saturdays in summer. Transfers are available from city buses. Trondheim has around 100 city bikes available for citizens and tourists. You will find the bikes in different 10 bicycle racks in and around the city center (from May through October). Bikes must only be left locked to a designated rack; however they can be picked up and dropped off at different locations.